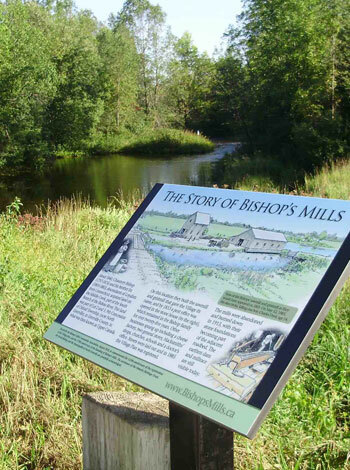 For a quiet rural hamlet located off the beaten track Bishop’s Mills is a remarkably thriving and vibrant community! Bishop’s Millions came out to celebrate winter with their neighbours on Sunday, Feb. 6, 2011. They enjoyed public skating, broom ball and other ice/snow games at the park in the afternoon, then all gathered at the Community Hall for a heart-warming pot luck-supper. A General Meeting of the Bishop’s Mills Community Association followed. 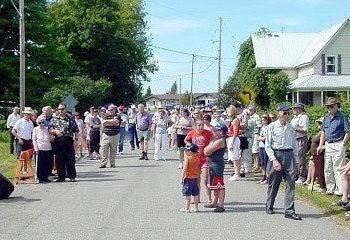 Nearly 200 people were in attendance to celebrate the history of Bishop’s Mills the weekend of August 28, 2010. The warm and sunny afternoon included games for the children, displays from local crofters and artisans and other historical information, live music and dancing, and a few animals from the local alpaca farm. The focal point of the day was the unveiling of the historic plaque commemorating the founding of the village in 1840 by Chauncey and Ira Bishop. Local resident Tom Graham spoke of the vision the Bishop brothers had when they first set up the mills and the present and future this community holds. David Bishop, a resident of Toronto, and descendant of Chauncey, participated in the unveiling along with life-time resident, Mildred Adams. Many politicians were present and offered their congratulations to the residents of the hamlet – MP Gord Brown, MPP Steve Clark, and Mayor Bill Gooch each had kind words to say about the vibrancy of this little village and the value of appreciating the village heritage. Many volunteers were involved in the planning and organizing for the day including members of the Bishops Mills Community Association and the United Church Women. 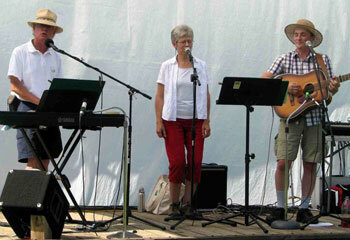 Music was provided by local residents and Bytown Bluegrass which includes Ray and Glen Adams, sons of Mildred Adams. Displays included quilting, spinning and weaving, crocheting, candle making, woodworking, and printed materials including history books, postcards and more. The Women’s Institute Tweedsmuir History books were also on display along with other contributions from local residents. Many visitors spent time viewing the photos and stories of village history. A delicious beef supper was served which included salads and corn along with a cake for the celebration! The Maplewood Ceilidh Band rounded out the day as Doug Hendry led a number of dances in traditional style. Participants and observers enjoyed the lively music. Local residents Robert and Liz Streight and family brought their own parade of five antique tractors to the park at the end of the evening.